I’ve had this coat in particular in my closet for an entire year now and haven’t been able to wear it (without feeling like said moron) in over a year. I am so happy Los Angeles is finally having a moment of chill so I can bust out all of my favorite “East Coast coats”. I am all about furry/fuzzy coats right now, or “fashion blankets” as I prefer to call them, because they really are the most wonderful way to dress up an outfit all the while remain totally comfy cozy. 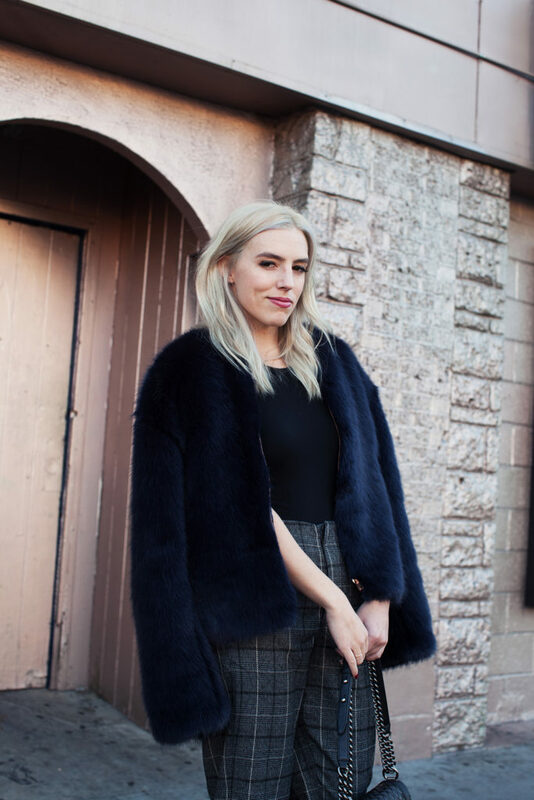 It’s no surprise that I love a good pair of high wasted trousers – I am especially loving them this season because they go great with some of my shorter furry coats like this deep blue colored one featured. 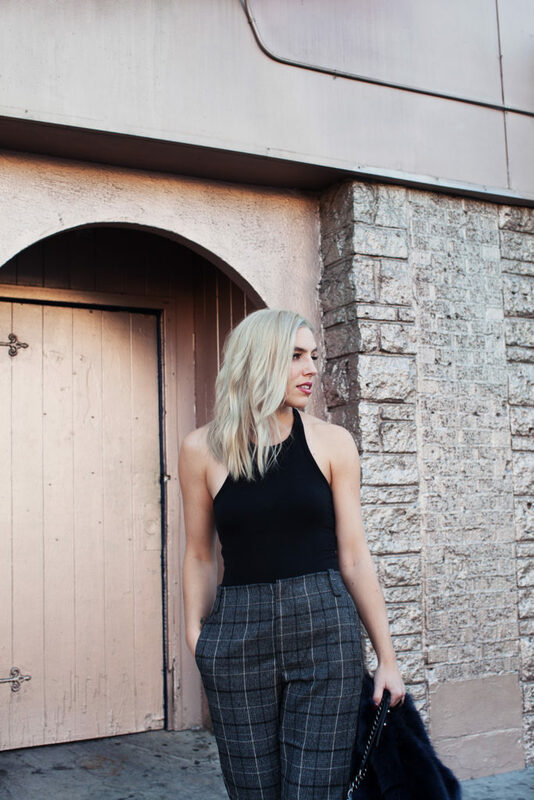 Once again I found these incredible pants on Free People, their pants game is just so damn strong, and I love that they are so different, versatile, structured, and that they’ve got a little hint of androgyny. They’re power plaid pants. But like, fun power plaid pants. I’ll be wearing these year ’round I guarantee, but in the meantime I am taking in all of the heavy coat action I can right now! What’s currently YOUR go-to coat? COAT: J Crew (old) BUT, Saks has a SUPER similar one for $248! PANTS: Free People – Rawley Menswear Pants – $69.95 (on sale from $128!!) these run a bit big if you want them to go higher up your waist I’d go down a size! Previous postTOP 6 “MUST HAVE” CAMEL COATS Next postHOW I MAKE BEING HEALTHY FUN AND EASY. I Loved the Fur jacket. Its look so soft and smooth. Overall i liked the outfit, it looks like semi-formal type. Thanks!